You probably have heard that mentioned by lots of people who have visited the Florida Keys previously and waxed lyrical about things you should do whilst you are there. But if you were like me, I had absolutely no idea what one of these things was no matter how many people mentioned Robbies Marina, as the place to feed one. But after a visit to this, just one of the many truly lovely Islamorada attractions you will be in no doubt. And also like me, I’m sure you will make the effort to come back again and again. So like most of the pages on this site, we will start with telling you exactly where Robbies Marina is, and then tell you what’s there, how long it will take to visit, and all the other information we are sure that you are looking for. Robbie’s is a little place on the Islamorada, if you have no idea where Islamorada is then click through here. The mile markers are the small green sign that you see on the side of the road, and are great especially on the US1 where you can only get North or South. So look for MM 77.5 and then take a tight U turn, and it’s only a short drive from that point onwards until you see the slightly….ok more than slightly battered buildings that mean that you have arrived at Robbie’s Marina. Park anywhere down the drive, and then walk the last part. What Is There To Do At Robbies Marina? Although this is one visit that probably won’t take more than three quarters of an hour if you have just come for the Tarpon feeding, it is one that is certainly memorable. They are huge and to be honest a bit scary, until you glance around you and see the small children delightedly dangling the food they have bought up in the air. We thought, ok if a small child can do this then so can we. 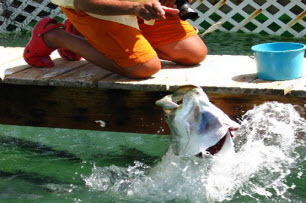 On a daily basis between 50 and 100 Tarpon swim around the docks at Robbies Marina safe in the knowledge that the endless stream of tourist will not disappoint and bring them lunch, dinner and breakfast. And for the cost of $7 for a family four most people visiting do just that. It actually costs $1 dollar to go on the dock and see the fishy frenzy and then $6 dollars for a bucket of Robbie’s fish bait. However if you are like us, once you gain you nerve you will probably buy more than one, as it is so exciting to feed these huge fish, and also see the battle between fish and pelican that also comes to Robbie’s for the easy snacks on offer. What Else Is There To Do Whilst At Robbies Marina? Well because this is a marina, for anyone that fancies getting out onto the Florida Keys waters then this can be arranged too. Either fishing trips, eco-tours, or a trip over to the historic sites of Indian Key or Lignumvitae Key Botanical State Park are all there for you enjoyment. If you do decide to go over to Indian Key, then you will really be transported back in time to see one of the original settlements that started bringing the Florida Keys into modern times. Take a towel with you as there is a small beach that you can swim from. Whilst we are talking about burning some calories and being energetic although the tours can take you over to the Keys, Robbies Amrina can also hire out Kayaks and Canoes for you to paddle yourself across. Its quite an easy paddle and will only take you about 40 minutes or so, once you get a hang of it. Right I'm Hungry Now...Is There Anywhere To Eat At Robbies Marina? 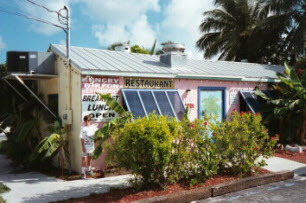 The building doesn’t look much as it has been standing there since 1947, but certainly the food is a great example of “conch” . If you find a restaurant that the locals go to, you can bet your bottom dollar that the food is good, and certainly from our experience “The Hungry Tarpon” has never let us down. So what we would recommend is to aim to get to Robbie’s an hour before you fancy eating. Spend the hour feeding the fish and then wander over and feed yourself. All in all one of the best things you can do whilst your here, but make sure you check out what else there is to do on the island of Islamorada, as other attractions will drag you back year after year. What Hours Does Robbie’s Open? Robbies opens early at 8:00am, although if you want to phone and discuss with them about opening even earlier then they will.